Rose Quartz, according to the experts over at colour specialists Pantone, is “a persuasive yet gentle tone that conveys compassion and a sense of composure. Like a serene sunset, flushed cheek or budding flower, Rose Quartz reminds us to reflect on our surroundings during the busy but lighthearted spring and summer months”. So, there you have it. Hard to imagine the spring/summer months with our rotten weather at the moment but hopefully they’re just round the corner. We love the way our Italian friends over at Bonaldo have used this colour on one of their newest bed designs, Picabia. 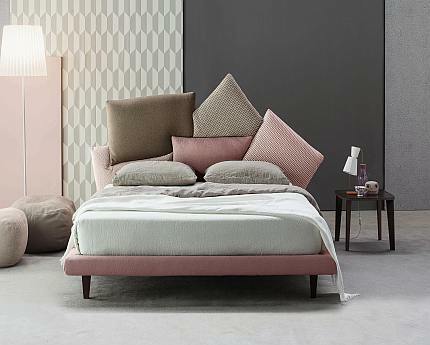 The bed frame and three of the main headboard cushions are in shades of dusky pink, with other cushions plus the bed throw and wall colours, in complementing linens, wenge and greys. Beautiful! Picabia is a really unusual bed design with five individual cushions that make-up the headboard, all of which can be upholstered in matching or contrasting patterns and textures, a nice alternative to opting for just one overall colour. Bonaldo have also used shades of pink on their new Blazer armchair by Mauro Lipparini. We love this design which Lipparini has had great fun with, creating a design silhouette that, he tells us, is similar to that of a jacket draped over the back of a chair. 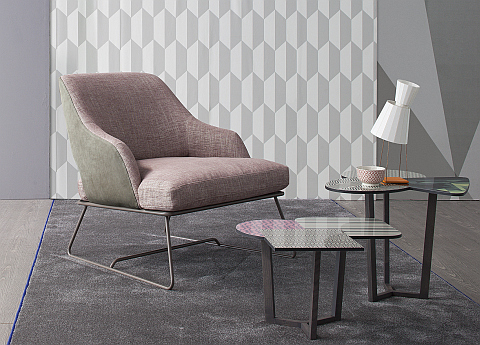 In this image, Bonaldo have used a great combination of materials, with a dusky pink fabric for the main seating and soft grey leather for the backing. Those colour pairings never seem to fail. And the grey geometric wallpaper in the background gives it all a very grown up look. A little closer to home, Dulux the paint people have chosen Cherished Gold as their 2016 colour. They’re also “celebrating the beauty of contrast, whether that’s the difference between pale and dark, or organisation and chaos”. We’re not sure on a personal level we ‘celebrate’ the contrast between organisation and chaos – just achieving a little more organisation would be welcome! 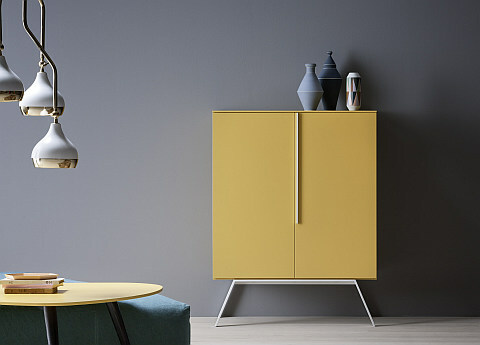 Novamobili’s contemporary Clio cupboard is available in a beautiful ochre finish (similar to Cherished Gold) along with four other finishes, and what we love about the styling here is the contrast between the striking deep yellow/gold of the cupboard set against the deep blue/grey of the wall. Two combinations that are complete show stealers, with the earthy gold adding a touch of glamour in an unshowy way. As with any colours, lighting is incredibly important – a colour that might look great in daylight in a north facing room (low light) might look totally washed out under electric light. Our neighbours, John Cullen, just along the Kings Road are the experts to talk to if you’re looking for some advice on how to cleverly light a room. And some brand new and very stylish pendant lights here from Italian specialists Contardi Lighting, who have also used shades of gold, along with accents of blue, white and yellow in a fabulous new collection called Calypso. 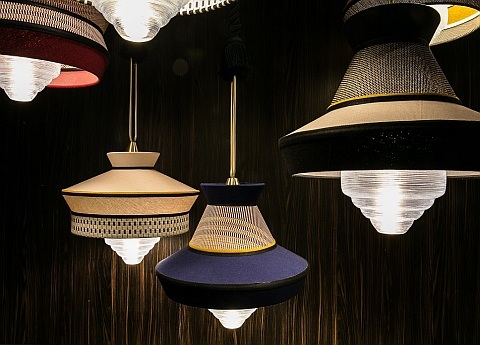 Designers Servomuto have taken shapes from 1940s South America and added frosted glass diffusers to create a slightly industrial feel, with ceiling roses in satin brass. So, whether it’s Rose Quartz or Cherished Gold – be inspired, be brave! We have so many different fabrics to choose from at Go Modern it can sometimes be quite daunting – but isn’t it great to have left the acres of beige and taupe behind at last!